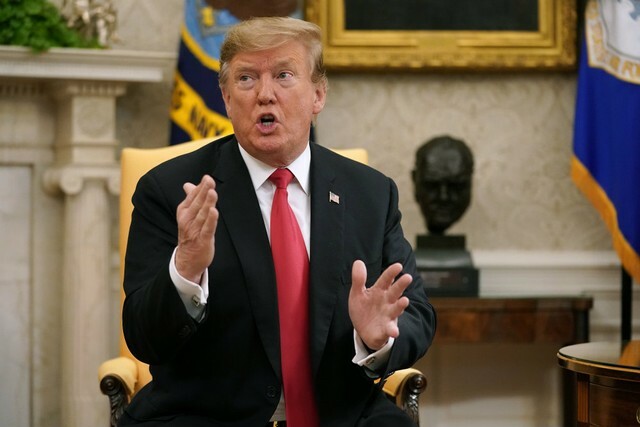 Donald Trump took questions from the press today during an Oval Office meeting with NATO Secretary General Jens Stoltenberg, using his time to mostly rant about migrants crossing the Southern border. That means it would have been a fairly normal day in our current world, if it weren’t for Trump repeatedly pronouncing the word “origins” as “oranges” and repeating a bizarre lie about his father being born in Germany. The president seems to be aware that he stumbled over “origins” several times because he immediately switches over to describe it as “the beginnings” of the probe after mangling the first attempt to make his point. As we’ve noted several times before, Trump has rough patches when it comes to sounding coherent while addressing the public. Depending on your favorite flavor of dystopia, the more disturbing incident from the presser may have come when Trump once again said that his father, a New York City native, was born in Germany. “Born in a very wonderful place in Germany, so I have a great feeling for Germany,” Trump said about his dad, who was actually born in the Bronx. Trump first erroneously stated that his dad was born abroad in an interview on Face the Nation in July, 2018. His father, Fred, is actually the son of German immigrants. In any case, the president’s brain appears to be in tiptop shape.